Facility to Divide All Data Items Including Emails, Contacts, Tasks, etc. 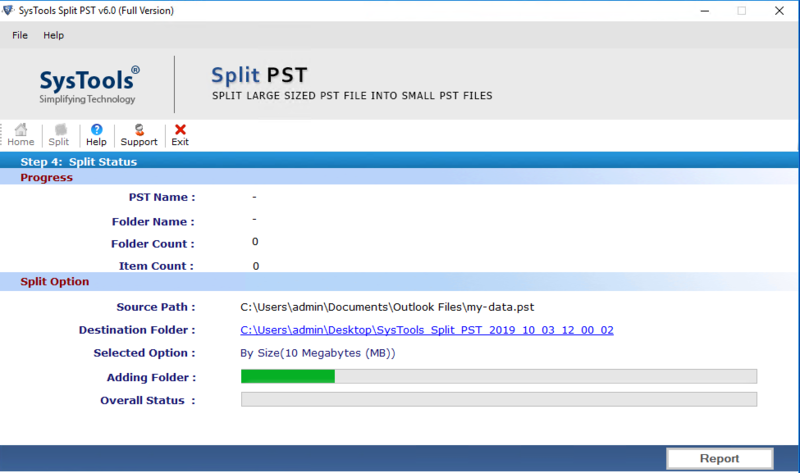 PST splitter tool enables the user to divide Outlook PST file of any size into smaller parts. In order, it is designed to split ANSI as well as UNICODE PST files without any data loss. Moreover, the tool keeps Meta properties like Cc, Bcc, To etc, intact after process completion. 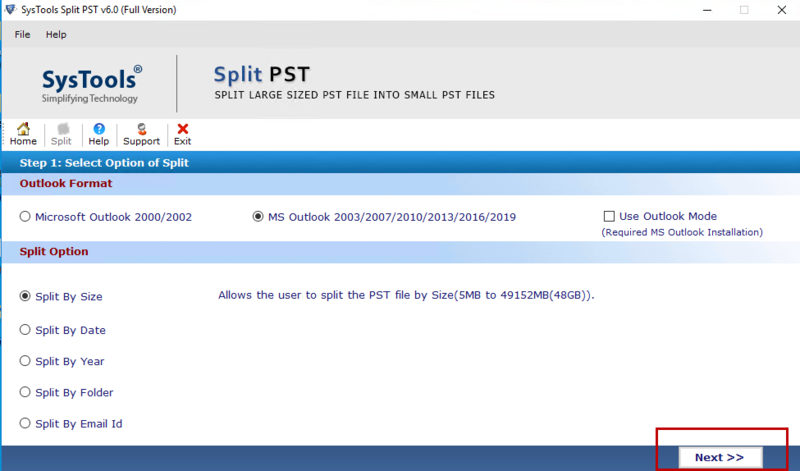 Split PST software provides an option to separate PST files into various parts having the same size. Users has to specify the file size range from 5MB to 10GB and the tool can split Outlook data file (.pst) into multiple smaller segments accordingly. Based on the folder, the PST splitter software makes the user eligible to create multiple PST files for each folder according to the size. It will also create one PST file for each folder within the MS Outlook and further break the respective folder size that is mentioned by the user. Suppose inbox.pst for the inbox folder & outbox.pst for Outlook folder, etc. If a user wants to divide the data in PST file on the yearly basis, then, they can use 'Split by year' option. This feature will permit the users to create an individual Outlook PST file for each year. For example- If you have chosen the year 2017 to 2020, then you have 4 PST files separately. Each file contains data for a single year within it. On the basis of specific date range, the users can split large PST file by date. This option helps to break 2 PST into smaller parts, one PST file will contain the items 'of and prior' to a particular date and other files will contain the data ‘after’ that desired date. 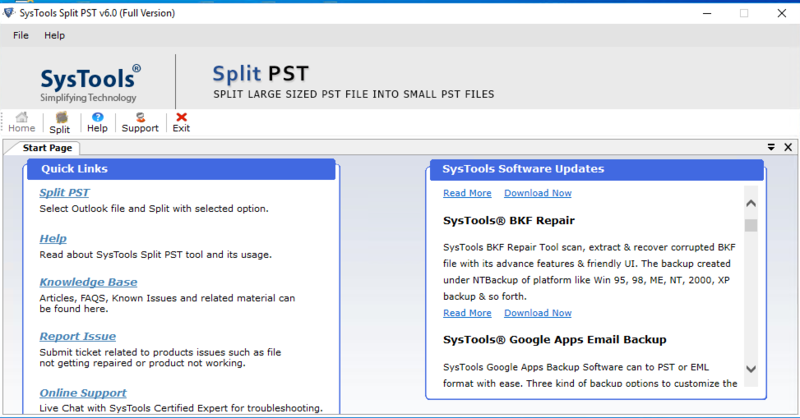 The Split PST software is capable enough to break archive.pst file or folder. Moreover, it provides an option to split Outlook archive data by date, by size, by year or by folder that can easily be managed after importing it into MS Outlook. Outlook PST splitter software does not support splitting PST data that are already corrupted or damaged due to its large size. Although, the users can reduce the size of PST file up to 2 GB; in the case of an ANSI PST format file. If the PST file becomes corrupted then, it is required to repair it back. Easily run this tool in any Windows OS. Once the PST division is finished then, save the progress report in CSV file format. After that, it is possible to save all PST files to any desired location as per users choice. Also, creates a new folder from the split PST tool pane if needed and then, save those files within it. By default, the CSV report gets saved at the similar location. Trial Version of PST Splitter Software will Split First 50 Items. Can you please help me out with the brief working of this tool? Will your software split the highly corrupted PST files? Yes, the software support the already corrupted PST files and split them easily. 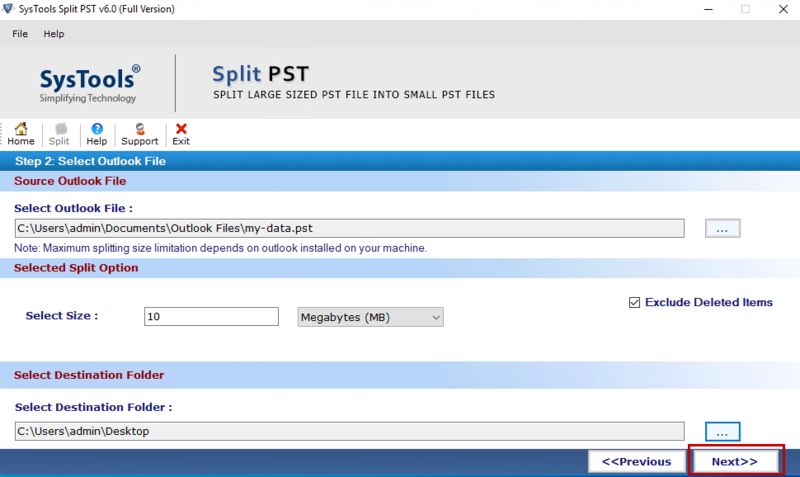 Is there any file size limitation imposed by Outlook PST splitter tool? No, there is no file size limit while splitting Outlook data file (PST). In addition, the user can use any one option out of four to divide PST file. How to reduce the maximum size of a PST file in an older version of MS Outlook? Yes, with this split PST software the users can support both types of PST files i.e., ANSI as well as UNICODE. However, you must have to choose the Outlook versions in software panel so that software can detect PST file automatically. Does the tool archives PST file directly to an external device? Yes, of course, the users can save PST file directly to an external device using PST splitter tool. It provides Browse option through which browsing all PST files and then, save them in a customized way. Does your PST splitter software break PST file into multiple smaller parts according to their size? Yes, our software will split oversized PST data into smaller segments using "Split PST by size' option without any data loss. Does MS Outlook installation required for splitting huge PST file? Yes, installation of Microsoft Outlook is mandatory to break a large PST file size. "It was getting too difficult for me to manage large PST files on my system. Also, I was facing the corruption issue in PST file because of maximum file size limit. One of my friends suggested me to use PST splitter software; It was really an awesome experience for me. With this tool, I can now split my huge PST files into small segments and thus, it became easy for me to manage large PST files. 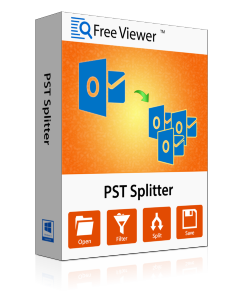 Thanks to FreeViewer Team to Developed the awesome tool"
"Split PST tool is an excellent program that separates PST files into two or more segments. It is possible to handle an oversized PST file on basis of four different options i.e., Split by year, size, date, and folder. Moreover, it requires Outlook installation while splitting Outlook PST items in an efficient way. I must say, PST Splitter software is capable to divide all PST items without any hassle. Thanks to the development team for making an awesome product." "I wanted to divide PST file so that I can manage my multiple PST files of smaller size. Someone recommended me PST Splitter tool. I have used the tool & got satisfactory results. Thanks to the developer team for making such an awesome utility!"